Laura Frantz is a Christy Award finalist and the ECPA bestselling author of several books, including The Frontiersman’s Daughter, Courting Morrow Little, The Colonel’s Lady, and The Lacemaker. She lives and writes in a log cabin in the heart of Kentucky. Learn more at www.laurafrantz.net. Can you please tell us about your newest book, A Bound Heart? Pair a beekeeping heroine with a kilted Scottish laird and an untimely death, and there are plenty of historical fireworks! The lovely cover is the essence of the novel, right down to the plaid shawl our redheaded heroine wears and the darkening sky that speaks to the suspense in A Bound Heart. This book is based on true events, specifically your own family history. Can you tell us more about the story behind your novel? 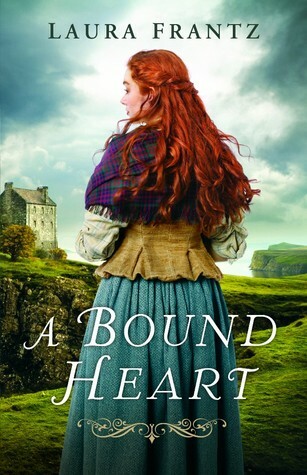 A Bound Heart was inspired by a Scottish ancestor of mine, so the story has special significance to me. My sixth great-grandfather, George Hume, was expelled from Scotland like the laird in the novel and landed in Virginia during the colonial period, an event that changed the course of his life and mine. I hope readers find this blend of fact and fiction as riveting as I do! Your novels usually take place in colonial America. What was it like to write a book with a completely different setting? Switching settings is always a challenge, as I explain in my author note. I try never to do this until I’ve been to the new setting first, experiencing firsthand what my ancestors or characters might have in even a small way—sights, sounds, smells, tastes, events, history, etc. Having spent time in Scotland, particularly the Hebrides, I felt the island setting was particularly epic and the history especially rich. The heroine is a beekeeper. Why did you choose this profession for her? I’ve always been fascinated with bees since I was a child in Kentucky and my grandparents kept them behind the garden. They were off-limits to me back then, but the fascination lingers. I also have several beekeeping friends, and my son even took up beekeeping as I was writing this novel. I’d never read of a beekeeping heroine, so the idea sounded delightful, and Lark was born! What type of research was required to write A Bound Heart? I relied on primary and secondary sources of immigrants and “felons” coming to America in the colonial period, as well as the Hume history in my own family. One particularly riveting source was a shipboard account of transporting criminals beyond the British Isles, which helped flesh out the portion of the novel that takes place at sea. And I always enjoy visiting Virginia and colonial Williamsburg as well as Scotland to help authenticate what I write about. What do you hope readers can learn from your novel? The enormity of what coming to America meant for our ancestors and for us today. Evocative and emotional, vivid and detailed. I happily return to the 1770 western Virginia frontier! It’s always a joy to see reading friends at https://www.facebook.com/LauraFrantzAuthor/, https://www.pinterest.com/laurafrantz/, and https://www.instagram.com/laurafrantzauthor/.